← Drink Your Lunch Like a Good Spaniard. I know that I tend to prattle on about dressing better than you have to. Especially if you are in the position to afford bespoke or made-to-measure clothing. But what if you don’t have USD$4,000 or more to spend? And what if you want to at least try and mimic the look and fit of a bespoke garment? These are questions that Thomas Mahon posed on his blog: The English Cut and in his video. Interestingly enough, there is a hybrid option available by mail order (or via the web.) Lands’ End is offering a full canvas construction, “tailored fit” suit which they have dubbed their “Boardroom Suit” for USD$720. At the moment you are limited to a brown plaid number suitable for weekend wear or for traveling, and a navy blue (suitable for everything.) The coat and trousers are sold as separates which gives you the advantage of getting closer to your actual size. No, you won’t be able to add pockets, choose your lining, designate the type and length of the vents, spec the lapel width, etc. . But not everybody loves to do that anyway. You will get side vents (good! ), merino wool fabric and working button holes with real horn buttons. In short, a suit that you will enjoy wearing and one that will move with you thanks to the hundreds of stitches that secure the three pieces of the coat together. 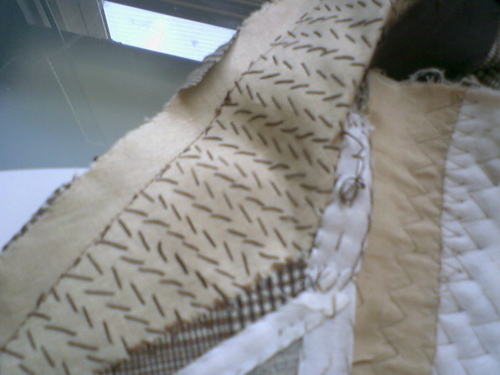 Thread stitches stretch, fused fabric does not. The catalogue states that they hand stitch the canvasses into the coat front, which for my money makes it worth more than a lot of designer label suits. Just make sure that you visit your alterations tailor to make the minute adjustments that will make sure that you are well-tailored. I would opt to have cuffs put on the trousers (your choice as they are plain front), the belt loops removed and the waist fitted to make sure that your trousers stay up and the sleeves shortened to show at least an inch of shirt cuff. Bringing the waist in or letting it out on the jacket, shortening the vents (although I prefer deeper) and fitting the neck to your own (no gapping around the collar), are all things that you should be aware of that may need to be done. Finally, as long as you’re ordering on-line take advantage of their custom shirt program, snap up some over-the-calf socks, a woven and a knit tie or two and several pocket squares. This entry was posted in Cultivating and tagged Cultivating, sources, tailored clothing. Bookmark the permalink. Before WWII in France there existed confetti. Confetti was basically the tier between ready to wear and couture. The garments were left unfinished to enable alterations to be made easily, thus giving the wearer the perfect fit. I am amazed no one has thought of reintroducing the tradition for both men and women. Let me make my first couple of million HOBAC, and we shall set the world on fire.